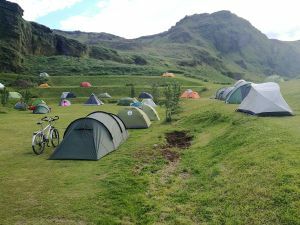 The camp site in Vik is characterized by the fact that there are MANY more tourists on the south coast. In the kitchen there is an electric kettle, a microwave and a toaster. This morning I'm in line to get water for my cappucino. People come to fill the thermos and the boiler seems unusually slow. To their excuse, they ARE building a new toilet building, but why the .... wasn't it ready for the season? Later, I have to line up to pee. There are two bowls and one is out of order. Let me get out of here. The Russian yesterday was eager to talk, but his English did not reach far, so I'm not sure how much I understood. When you retire you have free transportation and free medical assistance and hospital. That had been done by Putin. The daughter used to be their interpreter, but she is studying to be a doctor and could not travel. The son have brought a drone and his is not the first one I've seen. At Geysir there was a sign of a ban on drones. I myself am equipped with a mobile, a SLR camera with extra telephoto lens and an action camera. The mobile had been enough. I'm not a journalist, even though I love to report from these journeys. But here in Iceland I have no strength for much more than cycling. Changes some words with a Belgium. He has a Helly Hansen blouse on, so I ask if he is a Dane. Also in Belgium, they watch Danish series like Borgen and Crimes. Finally I get myself together to change the brake shoes on the back. There is something crooked, but it has to be worn off. I don't leave until 10. A French family of 4 leave just before me, but I have to withdraw money in the only ATM in Vik. It is Aron Banki as usual. No matter which bank you find, you pay a fee. Too much I think, I pay ample fee at home. According to the map it will be a flat day. There is not much wind, but it is against - what else? But it takes off as I drive away from the mountains. It seems to be a day in the green. To the back the mountains I left, ahead all green and nothing else. It is mainly lupins, here and there various grasses. 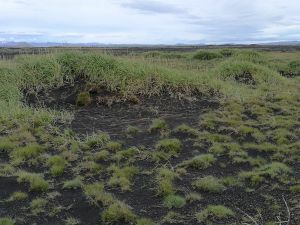 After 24 km an overgrown lava field emerges, and here is - unbelievably - a lay by at a small stream. It's now noon. It is Alaska lupine, it tells on a poster. Three types of grass are also named. Aha ... they have sown them to tie the sand and avoid sandblasting - is that so. It's the Myrdalsand I'm crossing. About approx. 10 km there will be a toilet. 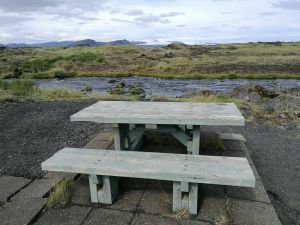 41 km before Vik, it comes - the toilet and some tables and benches that are occupied. Otherwise nothing. Somewhere in the distance something that must be Vatnajokull, but it is hard to decide where the clouds begin and where the ice ends. The road turns and finally some mountains begin to move closer. 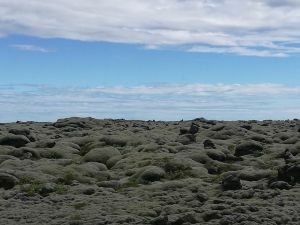 The Myrdalsand has been replaced by lava fields. As far as I understand from some posters, it is from the Laki eruption in 1741. They have been coated with a gray moss in quite thick layers, but it takes apparently still hundreds of years before the next species come. Clearly influenced by the temperature, but also the lava's composition presumably. In any case, I have seen how quickly the first species come to Etna in Sicily. Just a few years. The last km's are hard, but I don't feel the exhaustion until I've called home and knocked up the tent and is sitting at the restaurant. 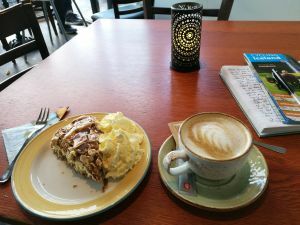 Must have a cappucino and a piece of macaroon cake with whipped cream for a fortune. Now I have to go home in the tent to lie down. Now at 18.30 I have not yet been down. Agreed with myself to have a shower before they all come running and afterwards I sat down to write. Sitting here in the kitchen / living room all alone. Lovely. 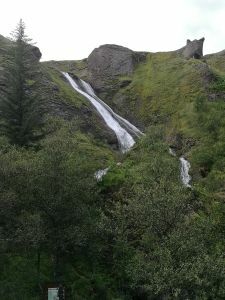 The city - if you can call it that - is called Kirkjubaejarklaustur. 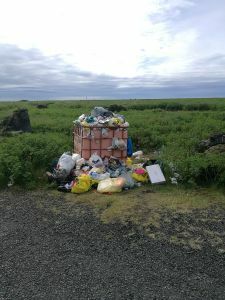 It was more than 75 km from one dwelling to the next, but there were at least 3 rest areas.